There used to be a time when I couldn’t convince Peyton to eat peanut butter to save my life. Then sometime this spring she decided she loved peanut butter and jelly sandwiches. So this summer she has been begging me to make them for her nearly every day. So today I gave in, again, and made her peanut butter and jelly sandwiches in dolphin shapes with one little heart sandwich too. When we had gone grocery shopping this weekend Peyton picked out some peaches for lunch. So today I cut them up into little wedges. Peyton has 2 loose teeth, making biting into a peach nearly impossible. But once I cut them into little wedges she can eat them, plus the wedges fit in the bento box and a whole peach would not. As I was looking through our snack shelf I found some HOME fruit snacks. 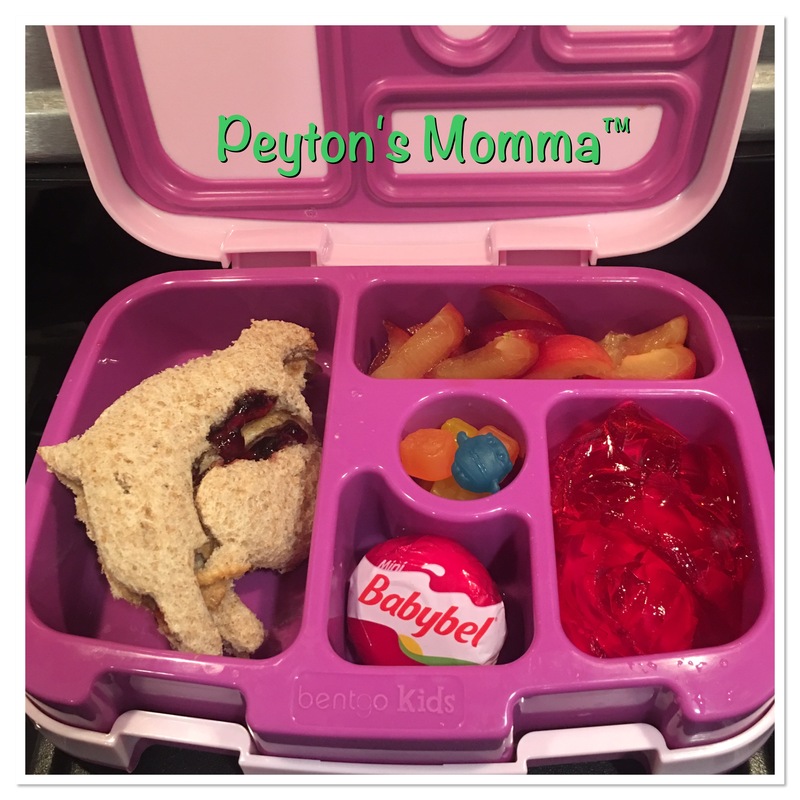 Peyton just had to have them so I took a package and put them in the bento box and that became her treat for the day. Peyton discovered Jello this summer. It makes a great lunch box item and today Jello made it into the Bentgo Box. And lastly, I tossed in a Babybel to finish off lunch. This was one of the easiest and quickest boxes to pull together.